So Many Rabbit Breeds, How Can You Pick Just One! There are 47 different rabbit breeds recognized by ARBA. To choose the correct breed for you, consider your time, the place where you live and who will handle the rabbit. If you are a busy person, do not get a rabbit that requires daily brushings. Do you live in a small place? Consider a dwarf rabbit. Is the rabbit for you? Who will handle the rabbit? If an older child will handle the rabbit also look into a dwarf rabbit. It will be easier to handle than a larger breed. Here is the list of the different breeds. Check out your favorite rabbit breed description here! Rex Rabbits - Here is some info. 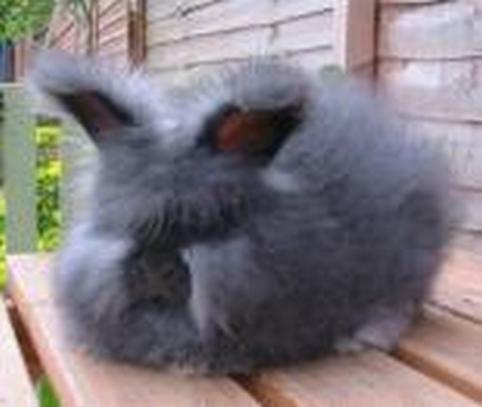 Angora Rabbits - Here is their history and care tips. When you decide to bring one of these wonderful house rabbits home, remember you have many choices to pick from. You can even look at your local animal shelter to see if they have any pet rabbits for adoption. Once a local shelter had a Lion head rabbit for adoption but was already adopted by the time I arrived. Lion head rabbit’s are a new breed, I believe. They are not even listed on the American Rabbit Breeders Association list of rabbit breeds. So I’m thinking they are fairly new. I just started to see and hear about them within this past year. When thinking of getting a pet rabbit, take your time and pick out the right rabbit for you. There are so many different breeds, colors and sizes that you’ll want to make sure you pick the one that is right for you. You don’t want to get a Giant if your space is limited because those rabbits are big. If you ever get the chance go to your local county fair and visit the rabbits there. There is usually a 4H Club and/or local breeders showing their rabbits. This is an excellent way to look at many different breeds at one time. You’ll get to see different sizes, shapes and colors. Maybe you can even talk to the breeders or handlers if you have questions. I just love to see all the different rabbits. The only problem is that I want to take them all home with me. Here is some information on a fairly new breed, Lionhead Rabbits They look like mini lions! Check it out and see if you don't agree.